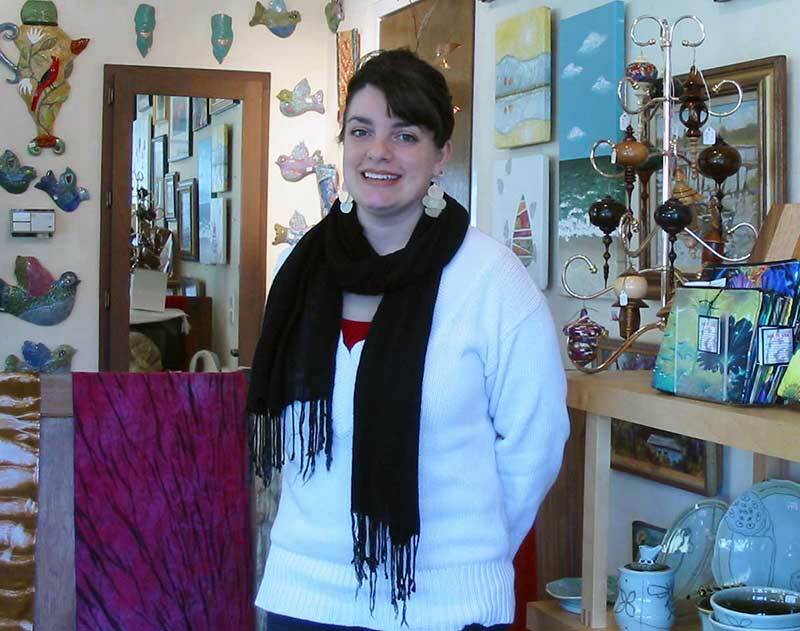 Sara Gress, owner of NC Crafts Gallery describes the operation of her gallery in Carrboro, NC. She talks about her challenges and her rewards. Sara supports and carries the work of many OCAG artists. Special thanks to Sara Gress, the owner of the NC Crafts Gallery, for the opportunity to interview her for this timely blog article. Timely because this is the gift giving season and NC Crafts Gallery is just around the corner in Carrboro, NC. Sara has been supportive of OCAG and has included the work of many OCAG artists, who are listed at the end of this article. Q: Sara, you have been supportive of the Orange County Artists Guild for many years, and your craft gallery has carried the work of many members. Tell us more about your relationship with these artists. A: Over the years I have cultivated rewarding relationships with many of the artists in the guild. Their work is of the highest quality. The jury process ensures that their craftsmanship is refined. It is a pleasure to work with them. Q: What influences your decision to accept a craftsperson for inclusion in your gallery? A: I have adopted a process that helps to ensure that we will have a productive relationship. I block out time so we can sit down together as I take a look at samples of their work. I like to see their work in person, touch it and admire its craftsmanship. I try to find things that are distinctively different than what I already carry in the shop. And I like to get a feel for how comfortable an artist will be showing his or her work in this gallery. Q: This last comment leads naturally to my next question, how can an artist work with your gallery for mutual success? A: I think that good communication is most important. If something is not working I like to be honest and point out what other types of things might sell more readily. Or advise about the prices. Or help the craftsperson think through what other approaches might be more successful at this gallery. Q: So, what kind of work does sell best here, at your gallery — which carries quite a variety of work? A: We are definitely a niche. 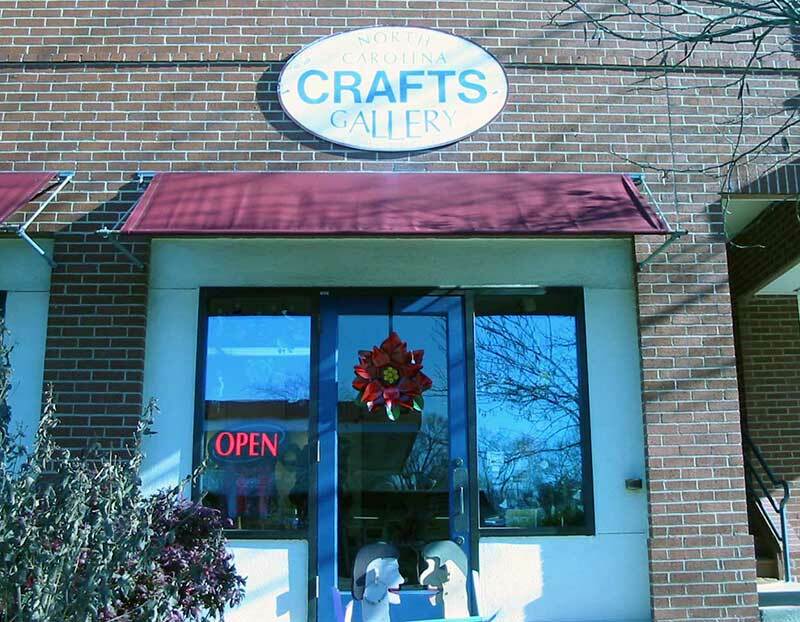 The gallery represents North Carolina artists and craftspersons. We have a variety of crafts. The list include pottery, glass, wood, fiber arts, toys, jewelry, garden art. Handmade goods that hopefully are accessible in price to most everyone! Q: What influences your decision to feature an artist for one of your monthly shows? A: Usually, I try to include artists that are established who already have their own customer list. This helps because we try to create an experience or venue where the artist benefits because their regular customers can come on to see their latest creations. And then their customers become our customers. So it is a win-win and an all around fun event! Q: As we talk I become aware of the fact that you seem to have a pretty good grasp on how to make things happen. What prompted you to become a gallery owner? A: Well I can’t say I intentionally set out on this path. I worked part time here on weekends and enjoyed being surrounded by creative people. Then suddenly the owner decided to retire and she was looking for someone to take over the gallery. She required that I work full time for a year to make sure I would enjoy the responsibilities, and be comfortable dealing with the bookkeeping, managing the shop and the inventory and all the behind the scene activities that do not involve the public! Q: And so, are their any particular skills or experience from the past that helps you in your present role? A: My first real job was a PR Director for a department store chain, so I learned public relations, advertising and retailing. At UNC, I was a Communications Specialist where I learned a lot about customer service. Also, I worked for Disney World. And my degree was in Business Management. Q: Sounds like you are right out there with the business experience, so from that perspective, what do you think are the major challenges for a gallery such as yours? A: It is pretty basic. Find new customers and make sure you keep the loyal present customers interested and engaged. This type of business does not carry things that people necessarily need. But there are things for folks to buy that they will cherish for many years, share as special gifts for their friends and family. And in some cases, folks become so enamored with a particular artist and their wares they continue to buy to start collecting. Q: So how would you characterize the NC Crafts Gallery and its offerings? A: I would say it is a gift gallery. A place where you can find a special gift, something handmade that is a little different. This kind of investment you make by purchasing a handmade object is potentially worth much more than than anything one could buy from a big-box store! Q: Describe a typical day in your life at the gallery? A: It is pretty haphazard. I pop from one thing to the next, doing emails, writing orders, setting up consignments, keeping up with inventory and sales. Then meeting on a regular basis with artists to review work brought to me and searching for new work. Q: The logical last question is, What brings you the most joy in working at NC Crafts Gallery? A: Well, I can be creative in how I display the work and hang the shows. But I most enjoy meeting with the artists. It seems like each one is in a good mood when they come in. And of course I love being surrounded by all these objects that reflect such an abundance of creativity and sharing it with the community. The NC Crafts Gallery has included the work of Sandy Beeman, Lynn Burcher, Julie Eastman, Carmen Elliott, Susan Filley, Louise Francke, Jamie Hagenberger, Deborah Harris, Shelly Hehenberger, Susan Hope, Cathy Kiffney, Marcy Lansman, Janae Lehto, Ann Matrone, Sandy Milroy, Dale Morgan, Jim Oleson, Elaine O’Neil, Frank Penta, Luna Lee Ray, Susan Rosefielde, Miriam Sagasti, Gail Schaefer, David Sovero, Hollie Taylor, Pringle Teetor, Trudy Thomson, Evelyn Ward, Rose Warner, and Emily Weinstein. For more information about the gallery, see the NC Crafts Gallery Website.